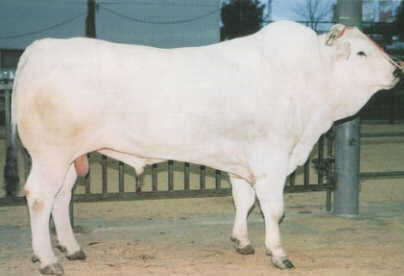 Chianina have short hair that varies from white to steel gray in color. Bulls are often a darker gray around their front ends. Both sexes have black pigmented skin. The short horns curve forward and are usually black in the younger animals but become lighter, beginning at the base, as the animals mature. The most noticeable characteristic of the breed is the extensive and well-defined muscling. The shoulders, back and rear quarters are especially well formed. The legs are longer than most breeds and the bodies are not proportionally as long as some breeds that have shorter legs. The faces are rather long and straight.